JNN 18 June 2014 Tehran : Iran will do everything to protect Muslim Shiite Shrines in Iraq, Iranian President Hassan Rouhani was quoted as saying by the official IRNA news agency on Wednesday. “We announce to the superpowers, the mercenaries, the criminals and the terrorists that the great Iranian nation will do everything to protect Shiite holy shrines in the Iraqi cities of Karbala, Najaf, Kazemein and Samarra” Rouhani said in Iran’s western city of Khorramabad on Wednesday. Many Iranian volunteers have announced their readiness to go to Iraq to defend the holy shrines and to confront terrorists, he said, adding that many Iraqis are ready to sacrifice for their country. 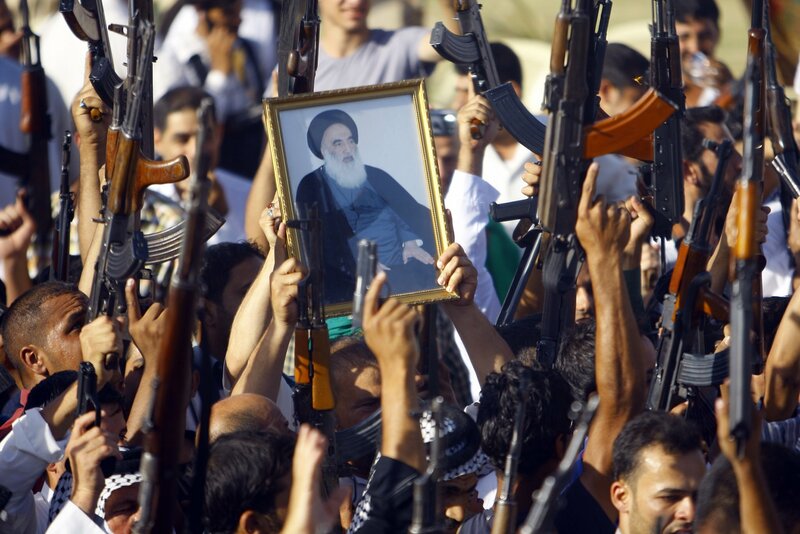 “Terrorist groups” and their supporters will be defeated in Iraq, he said. The Islamic republic will provide Iraq with consultations that could help Iraq’s army eradicate terrorism, but Iran would never directly be involved in Iraq, Iran’s Deputy Foreign Minister for Arab and African Affairs Hossein Amir-Abdollahian said on Monday. Iran and the United States announced Tuesday that they briefly talked about the advancements of the Islamic State of Iraq and the Levant (ISIL), the militant group that has taken large swathes of key Iraqi cities, on the sidelines of ongoing nuclear negotiations in Vienna. Mr. Rouhani’s words came as both the United States and Iran, which have a shared interest in containing the Sunni militants, have signaled a growing willingness to cooperate to prevent Iraq from falling apart. Underscoring a potential thawing in relations between Iran and the West, Britain announced Tuesday that it would reopen the British Embassy in Tehran. At least 12 people were killed and 47 others wounded in separate bomb explosions in the Iraqi capital Baghdad on Thursday, a police source said. Seven civilians were killed and 31 others injured when a car bomb exploded near a market in Shiite-predominant Sadr City district in northern Baghdad. The huge blast destroyed several shops and damaged several nearby cars, the source said on condition of anonymity. In a separate incident, a bomb exploded in central Baghdad, killing three people and wounding nine others. A civilian was killed and five others wounded when twin bombs went off near the Sinak bridge in central Baghdad. In addition, an Iraqi army soldier was killed and two others injured when a roadside bomb targeted their patrol in the Zaidan area, 20 km west of Baghdad. Those attacks came amid a week-long militant offensive in which insurgents have seized vast territories in northern Iraq. Iraq is witnessing some of its worst violence in recent years. According to the UN Assistance Mission for Iraq, a total of about 9000 Iraqis were killed in 2013, the highest annual death toll in years. This entry was posted in Iran News, Iraq News, Middle East and tagged Holy Shiite Shrines, Indians Kidnapped, iran, Iranian President Hassan Rouhani, Iraq, ISIL, Terrorists, Volunteers. Bookmark the permalink. TO BAHRAIN, SYRIA AND IRAQ , LEBNON BUT WANT A FREE HAND IN IRAQ , THE HOLIEST OF HOLY ISLAMIC PLACES . IT IS STRANGE THAT THESE INFIDELS , URFI MISYAR LOVING PROGENY OF JEWS CONSIDERS THEMSELVES MUSLIM WHILE THEY ARE NOT MUSLIMS AND ARE AGAINST THE ENTIRE SUNNI – SHIAS OF THE WORLD .